On the left, an unused HydroPack. On the right, a HydroPack soaked over night. Got a hold of a package of these from my sister who does relief/development work in Africa. These are little drink packs that work via forward osmosis. You sit them in water and a special membrane in the back of the pack begins to absorb water and filtering it in the process. Unlike conventional backpacking filters, the HydroPack membrane filters out even the tiniest viruses--it filters down to the atomic level, which is pretty cool. They do require a 6 to 8 hour wait time while they absorb water --basically overnight. After they've filled up, you can use a supplied straw to poke a hole in the pack and sip. There's some good and bad to the design. Lightweight - These weigh next to nothing. Compact - flat and easily packable. 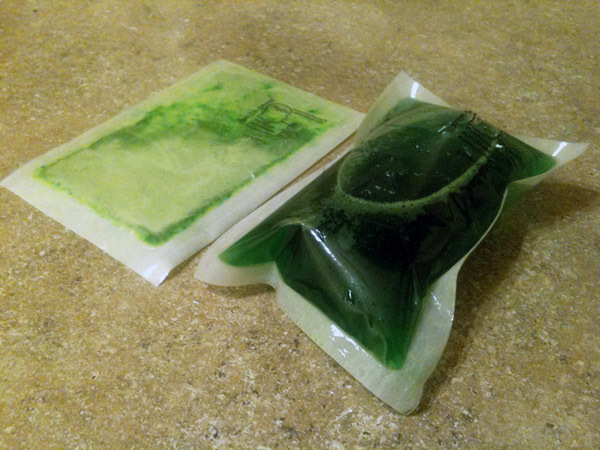 Easy to use - Plop 'em in water and wait. Not much energy expended. Flavored and added nutrients - The HyrdoPack is fill with a sort of sports drink mix - some sugar, vitamin C and other stuff. They work! After an overnight wait, you've got something like a big Capri sun full of sports drink - 12 to 15 ounces. The F/O membrane will filter out nasty stuff that even a good filter will miss. No need for extra chemical treatment, no clogged filters. The HydroPack needs to be left to sit for 6 to 8 hours--basically overnight. Not really a product that's useful for those on the move or when you need a drink right away. They're only 12 to 15 ounces - you will need 5 or 6 of these, at least, to stay hydrated throughout a busy day. Once removed from the water, the full HydroPacks leak/sweat a small amount of the sports drink through the membrane. Enough to make a bit of a mess in a pack, on a counter, etc. It produces a sports drink, not water. The sports drink is not very good tasting. Not horrible and almost certainly better than alternatives, but not very good. The price. While the manufacturer supplies these for disaster relief, the commercial product is $20 for six HydroPacks - $3.33 per pack. While they are an innovative product, HydroPacks in their current form are a limited use product at best, especially given current prices. I could see some use for very dirty/shallow water that would be difficult to obtain otherwise - you could drop a few of these into a muddy puddle and have a safe drink the next morning. However, most users will be better off with more conventional water treatment methods and adding some kind of drink mix to improve flavor if so desired.